June, July, and August road projects in Concrete will shore up potential problem areas and make travel lanes safer for folks on foot and behind the wheel. In order to create this pedestrian connectivity, the old concrete “rocks” that originally bordered the street had to be removed and are being replaced with a concrete-block retaining wall. The new blocks will border the sidewalk on the north and south sides of the overpass. The project also calls for adding energy-efficient lighting under the overpass and replacing some lower-efficiency lighting with high-efficiency fixtures. Crews began work on the project on June 20 and expect to complete it by July 23, according to engineer Jim Hobbs with Burlington-based Ravnik & Associates, whose firm is overseeing the project. The Superior sidewalk project is funded in part by a Transportation Improvement Board (TIB) grant for $381,135, which Town of Concrete secured last November. The total cost of the project is estimated at $401,196, leaving $20,061 for the town to cover. Complete reconstruction of Main Street from Cupples Alley west to Superior Ave. is planned for late summer, with construction to begin on Aug. 20, immediately following Cascade Days. Two 12-foot-wide vehicle travel lanes, plus south-side curb and gutter, planter strip, and sidewalk are planned, as well as elements that bring the sidewalk into compliance with Americans with Disabilities Act (ADA) regulations. Engineers also will plan for the proposed Public Safety Building to be constructed on the west side of the Superior Building, and the planned public restrooms, which will be part of a multipurpose building sited in the northeast corner of the community garden. A long-term fix to Burpee Hill Road has been in the works for more than a year, since two separate slides caused slumping in the roadway just inside town limits in January 2011. Succumbing to excessive soil saturation, a 160-foot stretch of road subsided 4 to 6 inches, causing the pavement to fracture on either end. Town of Concrete closed the road for six weeks while county crews repaired the roadway. Earlier this year, temporary water-management measures were installed. In July, town engineering firm Reichhardt & Ebe will advertise for a contractor to complete the next task: digging out the 15-foot-thick layer of sandy soil that lies on top of a more sturdy clay base beneath the roadway, replacing the sandy layer with varying sizes of rock and gravel, and rebuilding the road surface. Disaster funding from FEMA is being sought to pay for the more extensive work. During Concrete Town Council meetings, engineer Cody Hart has stated that one lane of traffic likely will be open during most of the construction process, but the road will have to be closed entirely for two to three weeks at some point. Complete closure is a point of concern for Concrete businesses, because Lake Tyee residents are less likely to patronize Concrete- and Grasmere-area businesses when Burpee Hill Road is closed. 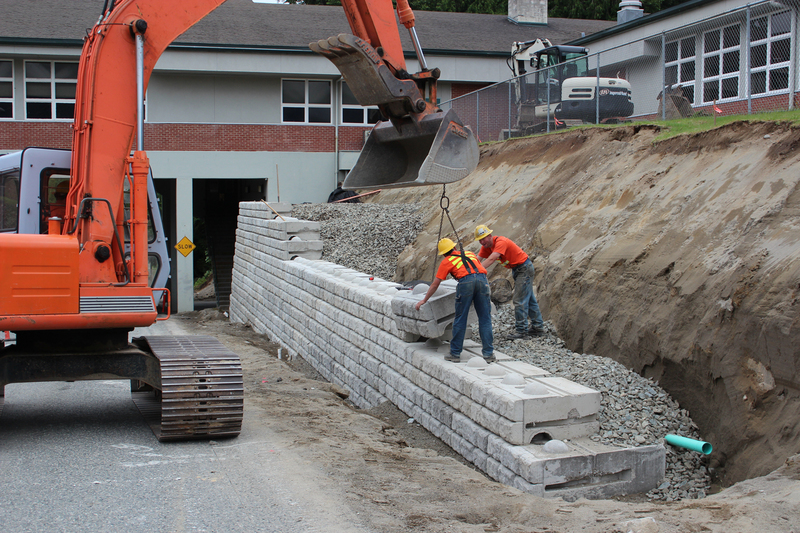 Workers move a Redi-Rock concrete retaining-wall block into place July 2 along the east edge of Superior Ave. S. at Concrete High School. Each block weighs about 3,000 lbs. The new retaining wall is a necessary component of the main reason for the project: adding a sidewalk along the wall’s base to create an off-street option for students on foot to walk down Superior Ave. South.